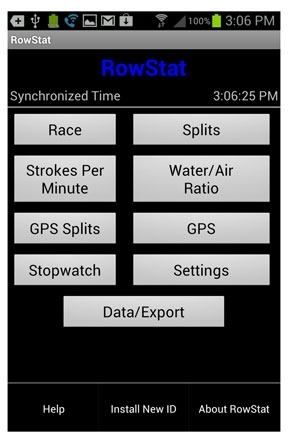 RowStat Lite, an Android App providing rowing software tools to improve the performance of rowers, coaches & officials. RowStat Lite is an Android App developed for mobile devices (smart cell phones and tablets). You can download RowStat Lite at Google Play. RowStat Lite provides functions to measure strokes per minute, splits, water:air ratio, dual stopwatch and save the data. You can organize and name the race or event, display the data or email or upload using GDrive or Dropbox. The data is in the CSV (Comma Separated Values) format and can be easily exported using email, Google Drive, Dropbox, etc.. Then importing the data into popular spreadsheets for analysis and graphing. RowStat also provides GPS enabled Splits and GPS to determine position and speed. A setting screen is provided so you can customize RowStat Lite, to improve its usability. All RowStat Lite screens have built-in Help: simply touch menu, read and scroll through the Help text and touch the back key to return to the feature you were using. RowStat Lite allows US and Int'l rowing coaches to compare the performance of each rowing crew they are coaching. RowStat archives practices and races (events) and assists coaches to objectively and quantitatively measure and compare rowing crew performance. You can save your data even if your phone is offline. Your data is saved locally on your cell phone's non-volatile memory. The picture of the key entry screen on the left will not allow you to enter an ID and Password. You must follow the instructions below! Go to Google play for RowStat Lite, please click here. Or simply search for "RowStat Lite", after accessing Google Play, using your cell phone web browser. You should now be ready to download an App from Google Play, hopefully a copy of RowStat Lite. 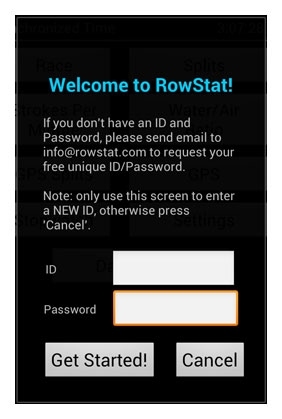 When you download a copy of RowStat Lite and install on your cell phone you will get the "popup" message, on the left. To enable your copy you will have to request your unique ID and password. Each consists of a six digit number. Simply complete our online form or send us an email to info@rowstat.com. Please include your reason Product Keys), name (First Last) and we will send an email to your email address your request originated from, containing the ID and Password for your copy. When you receive our email cut and paste the ID and Password into the entry fields on the popup. Press "Get Started!" and your copy will be enabled. When you have entered your ID and Password successfully you will get the home page for the RowStat Lite. A Race (event) will be created automatically when you initially select: Splits, Strokes per Minute or Water/Air Ratio. You can also edit the Race (event) information on the Race page. If you wish to save or export your collected data select Data/Export. You will have to name your file and provide an email address to export the data to. All RowStat Lite feature screens have built in help screens, select the menu button on your cell phone, then select "Help". After you have read the Help, simply use your cell phone back key to return to feature page you were using. A manual is also included and can be viewed and downloaded. As we get user suggestions and recommendations we will include them in the online manual. Our blog is available at http://rowstat.blogspot.com/ sometimes it might contain some bit of humor.